Reference number for this case: 14-Oct-54-Nîmes. Thank you for including this reference number in any correspondence with me regarding this case. What is this phenomenon which crossed Marseilles yesterday evening? Some will claim today that they too saw the phenomenon. According to imagination, it will be a "saucer", a shooting star, a meteor! For our part we will not affirm anything precise. Like our correspondents, whose testimonies we we report above, we will be satisfied to modestly say that it was really an unknown machine, but neither a plane nor a saucer. It enabled us to be neither for, nor really against the existence of these luminous objects. Around 01:30 p.m., Thursday, the residents of Fountaine-de-Vaucluse were in agitation because of the maneuvers of a white disc slowly hovering above the city, and which was clearly distinguished with the binocular. This white disc was surmounted by a segment of a sphere of the same color, and the lower circular edge carried, intermittently, two powerful fires, variable from the white to the purplished, passing by the red color. The air base of Caritat (Vaucluse) was alerted at once and two jet fighters took off. A few moments later, they veered above Fountaine-de-Vaucluse. It is here that testimonys do not agree any more: the residents stated "the two planes took altitude immediately and dove right on the disc which was still visible. But they could not reach it, for their speed was lower than the speed of the disc. Soon, planes and disc disappeared at the horizon." Two people, close to Nîmes, saw in a field, at nightfall, a craft absolutely similar to a rugby ball and appearing to rest on crutches. The strange apparatus raised in the airs while emitting luminous rays which soon formed a screen of orange colour. The disc remained like this dor ten minutes, reddened and disappeared towards the north. The observer went then to the place where the object had been posed. There was, he claims, a kind of shining cloud which fell slowly on the ground. Arrived home, it realized that his clothes were covered with a matter, a bit sticky, like parafinne. The two authors indicate that at a few kilometers to the north of Nimes, on October 15, 1954, at 10 p.m., according to newspaper cuttings and their files personal, two motorists returning from Alès, and arrived at 5 kilometers of Nimes saw a greenish gleam in a field. While approaching, they discovered the presence of a craft in all points identical to "a rugby balloon", which seemed to rest on crutches. The craft rose at this time, taking an orange colour gradually. The two motorists perceived a weak buzz. These two authors indicate that on October 14, 1954 at 00:15, Mr. and Mrs. Dupuy, a couple returning from the city of Alès saw at 5 km in the north of Nimes in the department of Gard, a greenish gleam towards the airfield of Mas-de-Rouvière, in a field. They approached and noted "lenghtily, the presence of an object in all manners identical to a football and appearing to rest on crutches." It was lit by a greenish light which filtered through three port-holes. Suddenly, the strange apparatus rose in the airs, emitting a weak noise and gradually taking an orange colour. The authors indicate that the sources are a letter by Mr. Gouiran, president of the V.E.R.O.N.I.C.A. group, to Michel Figuet; Le Provençal for October 15, 1954; Midi Libre for October 15, 1954; Garreau and Lavier in "Face aux ET" pages 163-164. "Nîmes - 30 - night: untraceable witness after investigation." Further in their book, they indicate that the newspaper "Le Provençal" du 15 octobre 1954 indicates that the observation took place the night at a few kilometers in the north of the city, with for witness Mr. and Mrs. Dupuy. They specify that they could not locate the witnesses because their name is very ordinary. They indicate that they determined by thought that the place was Les Capitelles, a location in a military field, and invite the reader to read their chapter on confusions caused by helicopters for the explanation. Godelieve van Overmeire indicates that in 1954, on October 14, in France, at the Mas de Rouvière (Nimes), at 0:15 "Mr. and Mrs. Dupuy in a car, see a greenish light in a field. They approach and observe a craft of the shape of a rugby ball resting on crutches. The dark mass was lit by a greenish light which filtered by three port-holes. Suddenly, emitting a weak noise, the craft rose while taking an orange colour." The source is noted "M. FIGUET/ J.L. RUCHON: "Ovni, premier dossier complet..." - Alain Lefeuvre pub. 1979, p. 160". 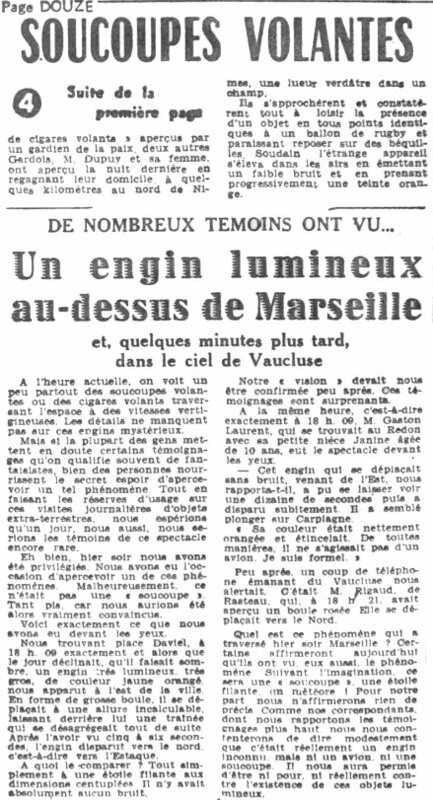 Luc Chastan indicates in his database that in the Gard in Nimes on October 14, 1954 at 00:15 hours, "a couple returns from Alès, when they see at 5 km in the north of Nimes towards the airfield of Mas-de-Rouvière, a greenish gleam in a field. They approach and note will all the time they need the presence of an object in all points identical to a rugby ball and appearing to rest on crutches. It was lit by a greenish light which filtered by three port-holes (dark mass).. Suddenly, the strange apparatus rises in the airs while emitting a weak noise and gradually taking an orange colour." Donald Johnson indicates that on October 14, 1954, at 12:15 a.m. five kilometers north of Nimes, France Mr. and Mrs. Dupuy saw an object shaped like a rugby ball resting on crutch-like landing gear. It was lit by a greenish light and had three portholes. The sources are indicated as Figuet, Michel and Jean-Louis Ruchon, OVNI: Le premier dossier complet des rencontres rapprochees en France, pp. 159-160, citing Le Provencal, October 15, 1954. *Oct. 14, 1954 - At 12:15 a.m. five kilometers north of Nimes, France Mr. & Mrs. Dupuy saw an object shaped like a rugby ball resting on crutch-like landing gear. It was lit by a greenish light and had three portholes. (Source: Michel Figuet & Jean-Louis Ruchon, OVNI: Le premier dossier complet des rencontres rapprochees en France, pp. 159-160, citing Le Provencal, October 15, 1954). 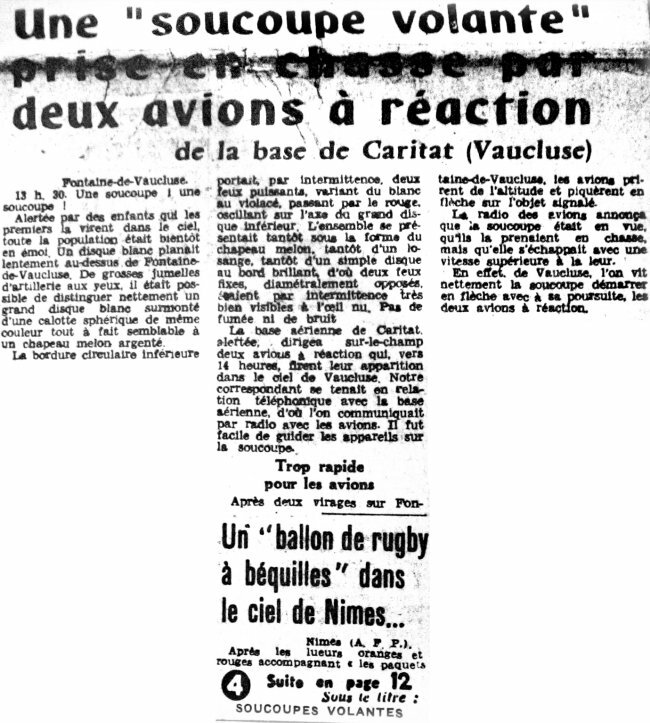 [---] Article in the regional newspaper Le Midi Libre, France, October 15, 1954. 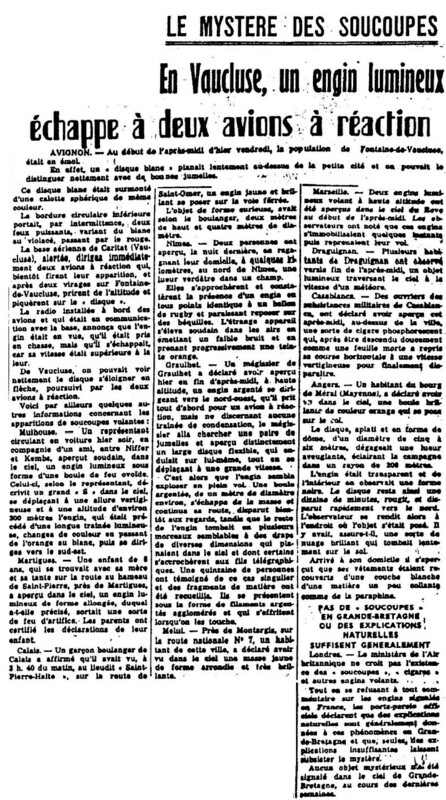 [le1] Article in the regional newspaper L'Est Républicain, France, October 16, 1954. [---] Letter by Charles Gouiran, ufology group V.E.R.O.N.I.C.A., to Michel Figuet, France. [fr1] "OVNI, Premier Dossier Complet des Rencontres Rapprochées en France", book by Michel Figuet and Jean-Louis Ruchon, Alain Lefeuvre publisher, France, pp 159-160, 1979. 1.2 Patrick Gross July 28, 2010 Addition [lp1]. 1.3 Patrick Gross August 15, 2010 Addition [le1]. 1.4 Patrick Gross October 15, 2014 Addition [ni1].